And if you’re looking for new projects – if you’re a quilter there’s Stitchin with Justquiltin and Strictly for the Birds and if you’re a knitter (or crocheter) there’s the Sticks ‘ n Strings Challenge. Information on all those projects can be found by clicking their respective buttons in the sidebar. All information for each project will be updated on those pages. I’m sure there will be other random projects – like a mystery quilt and a new Socktoberfest Challenge and whatever else my busy little mind comes up with – throughout the year. 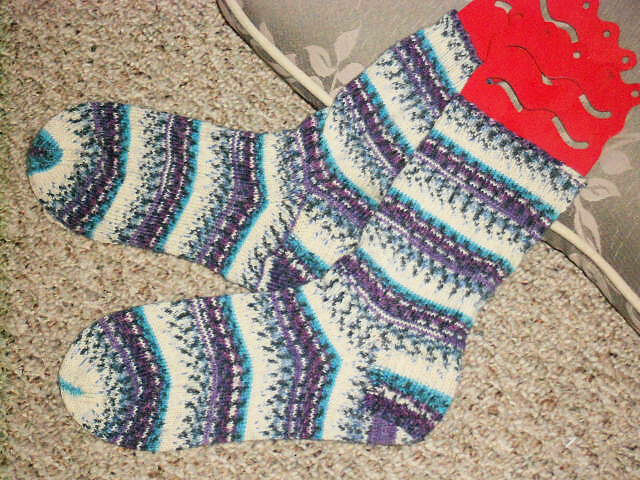 Here’s the final pair of socks I finished about 9:00 last night — my 21st pair for the 12 in 2012 challenge. 21 pairs of socks – I’m very pleased with that and would never have throught I could get that many done in a year. There’s at least 2 or three other socks that are only singles I did this past year that I need to make the mates on so I did knit on average about 2 pairs of socks per month in addition to the three Camp Loopy projects, the Rockefeller mystery shawl (which is only about half done and on my UFK list for this year, a couple scarfs (some of those on the UFK list) and a cowl. Also, you may remember the stranded mittens I had started with the purple and black yarns that I ripped out because they were going to be too small. Well I ripped the out and on Christmas Day, decided I really liked those two yarns together and the purple shades just happened to go with a coat that has that color in the plaid of it. So I decided to crochet a quicky cowl using those yarns held together since I don’t have a scarf or anything for that winter coat. So in a day or two I had this cowl completed. I’ve been wearing it the last couple of days and it’s cozy and warm. After finishing the socks last night I pulled out the scarf I had previously started with two strands of sock yarn — it’s made using the pattern for the One Row Handspun Scarf from Ravelry – super easy knitting. I’ll probably knit another 10″ or so or until I run out of yarn. So, if you participated in the 12 in 2012 Challenge and have not updated us on how you fared, please let us know. Did you meet your goals? 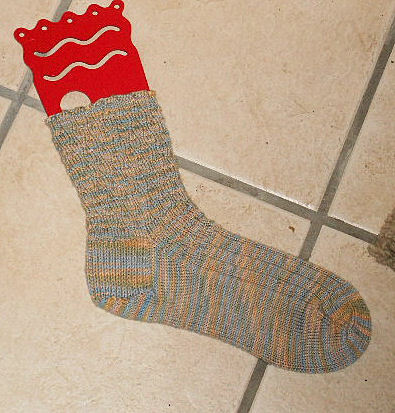 Are there 12 new pairs of lovely warm socks at your house? That’s Zoey – one of my niece’s dogs. She sat and posed for me so nicely that I just don’t know why they say she’s a bit of a hellion. LOL She was very sweet. Now to crank up the heat (it’s 11 degrees and I had to wait an add’l 20 minutes at the bus stop since I just missed the bus I really wanted) and then go get that sock done! A safe, healthy and happy new year to all! Yes that’s 20 in 2012 — way beyond my original challenge of 12 in 2012 — pairs of socks that is. I just added to the challenge page my 20th pair of socks. I can’t believe I finished that many. I actually have made more but some of them are still single socks at the moment. Can I get one more pair done before the end of the month? Maybe. The challenge is winding it’s way to a close — did you meet your goals? or some of your goals? (we won’t discuss that “no yarn buying” portion of this challenge – that fell upon the wayside long ago). I’m already busy figuring out the details of my challenge for next year! So far I’ve knit over 5 miles of yarn this year (again, we won’t mention how many miles I may have purchased — suffice it to say, more than 5 miles). Speaking of that topic we aren’t discussing (buying yarn) here’s what somehow miraculously arrived at my office this week from The Loopy Ewe. I think Santa must have sent it to me because I’m such a good girl, right? Are you nodding in agreement?? You’d better be. LOL This yarn is for the mystery shawl KAL on Ravelry that Judy – yes that Judy – is also planning on doing (no I did not twist her arm – she’s too far away for me to do that – no matter what she tells you). I still need one more color to go with these two but I plan to go stash diving for that one. It doesn’t start until December 27 if I remember right. In the meantime, we’re on blizzard alert here. Predicted – at least a foot of snow between tonight and tomorrow night in my area – more a bit north of here. And then of course blizzard winds setting in to add to the fun. I don’t think there’s hardly a school in the area that hasn’t already cancelled their classes tomorrow, including finals at the University cancelled. I did get a call after I got home that we’re opening the office at 9:30 rather than the usual 8 a.m. My determining factor will be if the city buses are running AND can get up the hill I live on. Tho I think it would be quite funny if somehow this storm missed us with everything that people were cancelling so early. Yarn? Did someone mention yarn? The boxes from my Black Friday yarn sale shopping have arrived. There all all kinds of goodies – here’s just a peek. I had dumped the various boxes into this one tall reuseable grocery bag to bring home. 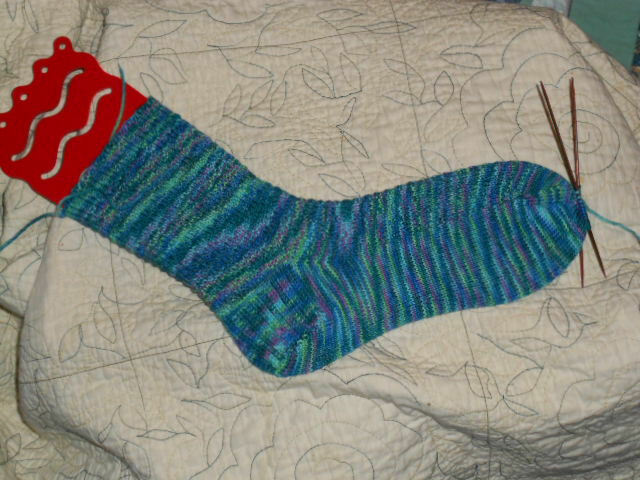 Another Tesserae sock done – hot off the needles this evening. 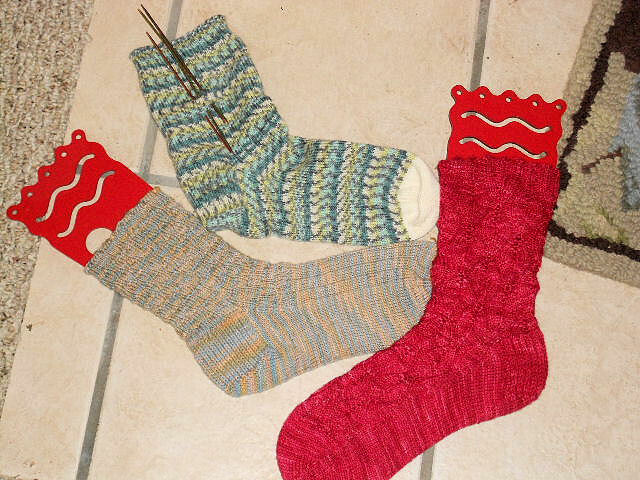 I’ve got these three single socks – all made within the last few weeks/month or so. The question now is, can I get the mates to all three of these made before the end of December. I’ve got 18 pairs of socks made already so have surpassed my 12 in 2012 Challenge (and my feet are loving all those great socks now that the weather has turned colder the last week or so. But time will tell if I can get them all done. How are you doing on your 12 in 2012 Challenge if you are playing along? I already have my new sock challenge for myself figured out for next year — nope not 13 in 2013 — too easy. LOL You’ll just have to see what the new year brings. No the lights have not gone out but the Candlepower sock pattern I told you I had started in the last blog post may now be in my top 5 or 6 favorite patterns to knit. I can’t get a real good picture of the detail inside (and of course sunset now is way before I ever get home at night) but here’s what they are looking like so far. I was a bit leery looking at the instructions with all the rows listed in the stitch pattern but after stitching about 7 or 8 rows of the leg pattern, I realized it’s easy to tell what comes next. Plus every other row is simply knit the knits and purl the purls so it would be easy to back track if the row got off — which it hasn’t. It’s easy to keep on track with the four needles holding stitches because each repeat is repeated once on each of the needles so you always know if you ended right at the end of each needle. You’ll have to check out the pattern on Ravelry to see the great flame patterns that don’t really show up well in my photo — did I say I love thi pattern?? These may turn out a bit small from me (which will be sad because I love the red color)or maybe not – have to wait and see. But if they do, they will go in my gift pile and I’ll definintely be making more of this pattern. I was just to lazy to get on the computer last night so here’s my On the Needles update. First — thanks to all who joined in the Socktober Opal Challenge and hope you have at least one new pair of Opal socks to wear this winter! It was fun to see all the different Opal yarns that were used and how they looked in the various patterns you chose. As promised, there are two winners of a free ball of Opal yarn, one from the post on my blog where you needed to leave a comment and the other came from Judy’s post and you needed to link up a photo. So…. drum roll please…..Judy D in WA and BethL in MD – you are the lucky winners. I will be emailing you to get your mailing addresses. As for what’s on (or in this case off) the needles here, I have now completed my 18th pair of socks – 18 finishes this year so far! These are the Gravel Grid sock pattern (find it on Ravelry) super easy pattern if you’re looking for one with a bit of texture rather than just plain vanill sock. They are made with Three Irish Girls yarn (with a touch of cashmere – it feels sooooo good). This is the pair where I made one toe too short so I ripped that back last night and they are now ready to be a Christmas gift. Earlier this week I started on a plain vanilla sock in some self patterning yarn I had in the stash – Patons Kroy Socks Jacquards. This is another yarn that I think is similar in wear and feel as Opal yarn — prior pairs I have made have been through the washer and dryer (tho I generally try to hang dry all socks but sometimes a pair slips through) and they just keep on going. And if you’re looking for a hard working, inexpensive yarn, check your local craft shops. I’ve found this locally in chain stores like Michael’s. What I don’t like about it – it’s put up in 50 gram/166 yard balls. One ball is not enough to make one sock for me (remember I make large socks). Hence the solid toe in the photo. I used all but about 12″ of the ball of yarn and it got me just to where I need to decrease for the toe. I managed to find some Jawoll at the quilt shop that was a good color to go with the sock so it all worked out. The Jawoll yarn felt slightly thinner than the Patons but Jawoll always comes with a spool of reinforcing thread inside the yarn so did toes with those held together and it came out feeling the same weight. I’ve been eyeing up some new patterns on Ravelry and with all these self-patterning and self-striping yarns I’ve been using, I’m contemplating perhaps a solid color yarn but then there’s also the “single sock box” I’ve been ignoring. Maybe I need to finish off the second sock for one of those pairs. 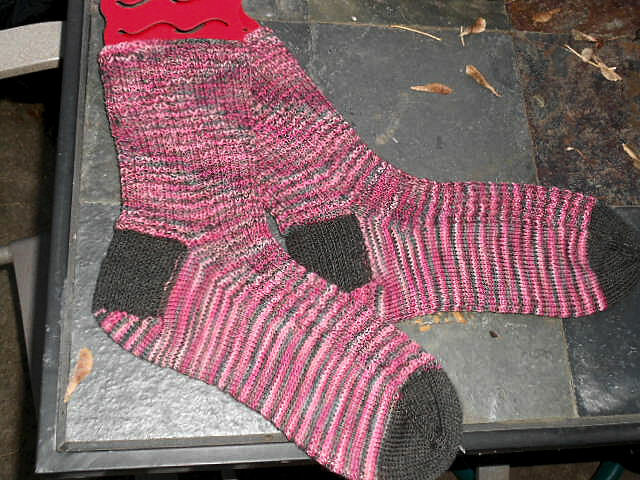 I finally finished a sock – I started this pair when I was home sick and it’s been slow going. Anyway – this one just needs the toe woven shut. 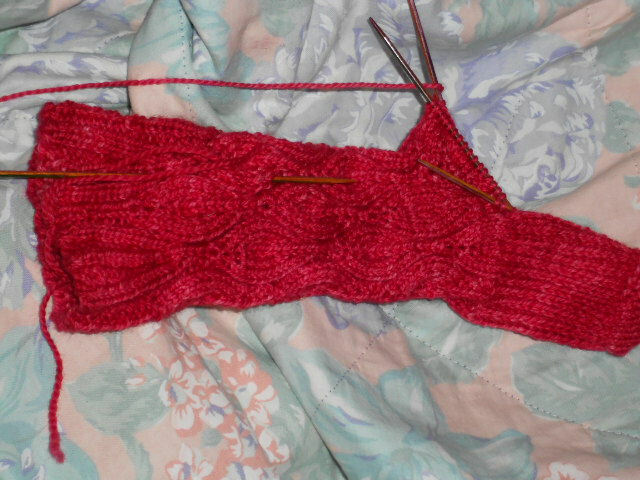 The second sock is the one that I decreased on the toe too quickly. So I need to unweave the end and rip it back and fix that. I should have just enough yarn left to do that which is lucky. 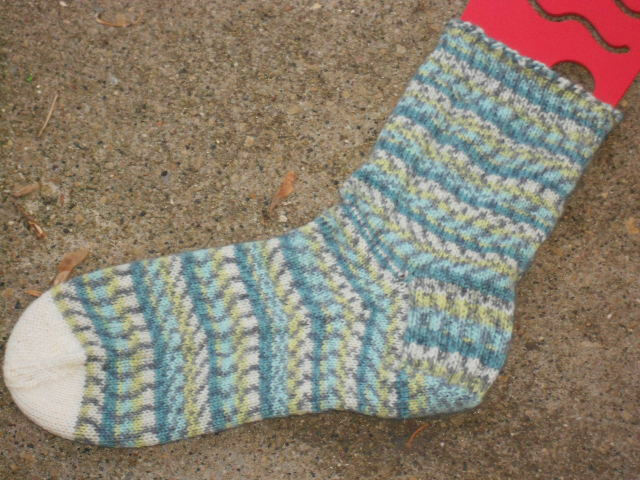 The pattern for this one was Gravel Grid Socks by Jessica Baird (you’ll find it on Ravelry). My picture doesn’t really show the texture well. It reminds me of that sort of thermal shirt waffley texture. Super easy pattern stitch to memorize. In the meantime, I needed a sock to work on during the bus ride this morning so I started another pair of plain vanilla socks out of a self patterning yarn. 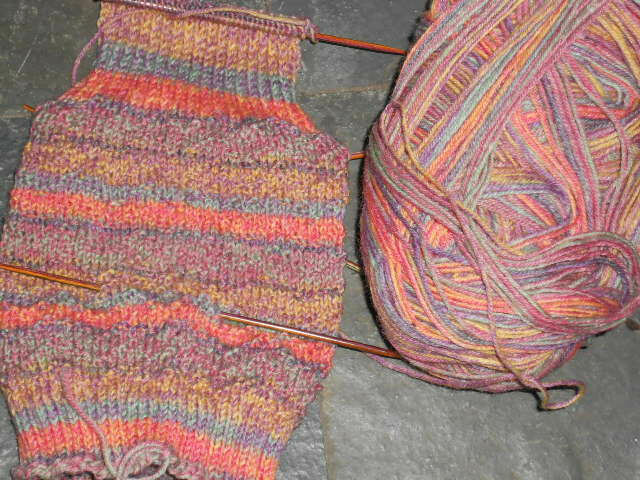 First — on the needles tonight – this pair of Zigzaga socks done in one of the Opal Bicolored yarns. 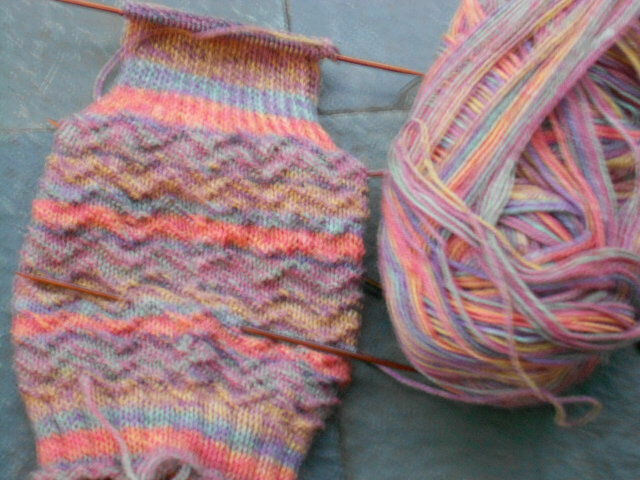 The heel flap is done and I’m ready to start turning the heel. This is the first sock of my fourth pair of socks for my Opal yarn Socktober Challenge. I challenged myself to make four pairs this month, which I knew was a tall order for one month, and with five days left — maybe, just maybe I’ll make it. It will come right down to the wire…. do I have to work every day next week???? Yes. LOL So we’ll see what happens since I’ve got other things I need to do than just sit and knit all weekend. Now this next blurry photo of the zigzags, yes I know it’s blurry, but it actually shows the zigs and zags which the prior photo does not. So you can see the neat textural pattern it makes. What’s off the needles??? My pair of Sutton Spirit socks. 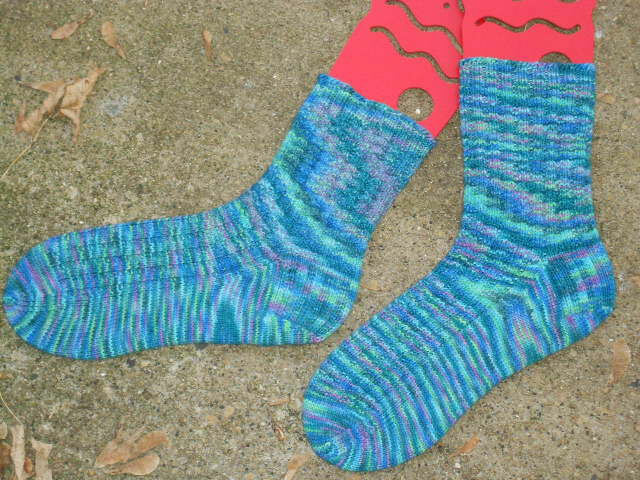 This is Opal Socktober Challenge pair number three and in the 12 in 2012 challenge, my 17th pair of socks since the beginning of the year! I will have such warm and colorful feet this winter. Or this weekend since the hi for the next week or so is in the mid to upper 40s. Pair # 2 is done! Finished the toes on them early this morning as I was sipping my coffee. But 16 new pairs of socks so far this year — I’m real happy about that. Can a girl have too many pairs of socks? I don’t think so (especially as much as I hate doing laundry).